"Under My Hat" marks the return of the legendary Hammond B-3organist and woman's jazz pioneer, Sarah McLawler. Sarah may have been the first woman jazz artist to popularize jazz organ in the tradition of Wild Bill Davis. She led all-women jazz ensembles like the 'Syn-co-ettes' in the very early days when it was more difficult for women to compete with their male counterparts. Today her group includes some of the best women jazz artists in the business. Together they romp through some originals as well as some jazz standards which Sarah feels will bring back the swingin' feel of jazz to those who remember it well. Her all-woman ensemble features world-class musicians like the talented multiple reed player Carol Sudhalter, violin virtuoso Sonya Robinson, and the legendary bassist Carline Ray. 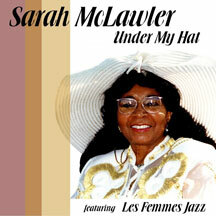 Sarah McLawler may be the only remaining disciple of Wild Bill Davis who is actively performing. Her all-woman ensemble features world-class musicians like the talented multiple reed player Carol Sudhalter, violin virtuoso Sonya Robinson, and the legendary bassist Carline Ray. Her vocals and instrumentals clearly recall the golden era of swing jazz.